i.e. essentially as the temporal derivative of the oscillation phase φ. (Without the factor 1/2π, one would have the instantaneous angular frequency.) In contrast to a Fourier frequency, the instantaneous frequency is generally a time-dependent frequency. The instantaneous frequency of a sinusoidal signal is constant and equals the oscillation frequency, as expected. 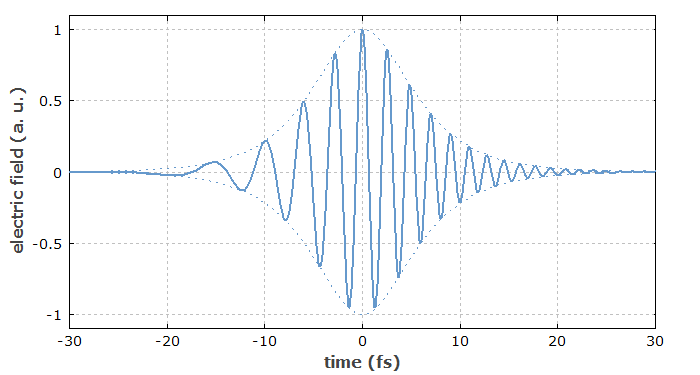 Figure 1: Electric field of a strongly up-chirped pulse, where the instantaneous frequency increases with time. The concept of the instantaneous frequency is particularly important in the context of frequency noise and phase noise, but it is also applied to chirped optical pulses (Figure 1), which have a time-dependent instantaneous frequency. 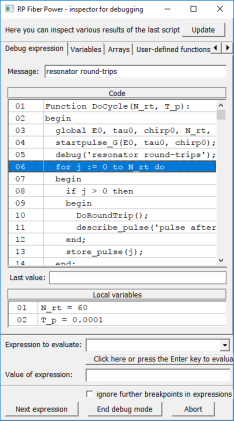 The basic idea is intuitive, actually more than that of Fourier frequencies. The same concept is used e.g. in music: music scores essentially specify notes as time intervals for which the instantaneous frequency has a certain value (corresponding to the pitch of one voice, and disregarding overtones). However, the concept can become problematic for complicated signals, e.g. for white noise. In the context of lasers, the instantaneous frequency can be easily defined for single-frequency lasers, whereas for multimode lasers one would first have to separate the different frequency components (with some filtering technique) before retrieving their instantaneous frequencies. The instantaneous frequency is also useful in the context of chirped optical pulses, where the instantaneous frequency varies during the pulse. Note that the Fourier spectrum of an oscillating signal (in optics, the optical spectrum) does not represent the probability distribution of instantaneous frequencies, and that the linewidth measured from such a spectrum is not an r.m.s. (root mean squared) value of the instantaneous frequency. The relation between instantaneous frequency and Fourier frequency is significantly more subtle than that. The time dependence of the instantaneous frequency can sometimes be estimated from a spectrogram. However, a plot of instantaneous frequency versus time generally does not carry the same information. The instantaneous frequency of an electronic signal (e.g. a beat note) can be obtained using a phase-locked loop (PLL), containing a voltage-controlled oscillator (VCO) and phase discriminator in a feedback system which forces the VCO to follow the oscillation of the input signal. The input signal of the VCO can be used as a measure of the instantaneous frequency. The basic idea of this approach can also be utilized in the form of a software phase tracker, which evaluates the instantaneous frequency of an already recorded signal. This approach is simple to implement but has some flaws, particularly the limited bandwidth and delayed response. Significantly more powerful, but also more complicated techniques utilize fast Fourier transforms.